Our Makassar cruise port guide gives you information about the docking location, cruise dock, transportation options and much more! 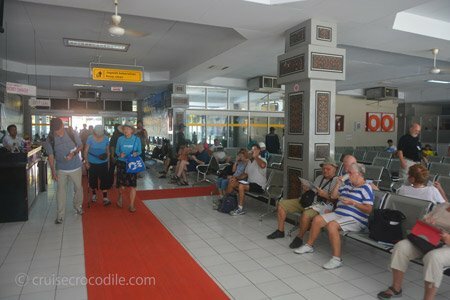 Welcome to the Makassar cruise port guide. Makassar or formerly known as Ujung Padang until the president changed it again in the 90’s. Both names are still being used today. 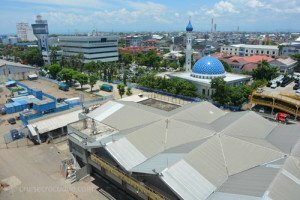 Makassar is the a large town on the island of Sulawesi. This could be the most unusual island you can come across in Indonesia. Burial rituals, food and language here are all different compared to other islands. Makassar lies all the way in the southern part of the island. Here we find a rich history of cultures that all fought for the power and monopoly in the area. We also find a beautiful city that is full of possibilities. Tour around by trishaw or taxi to get a feel for the place. When the ship is docked this will be your view. The dock is right in the middle of town. This is the cruise terminal of Makassar. Inside are limited facilities. The terminal provides free wi-fi. From the ship you can already spot the freelance taxis. Negotiate the fare for a customised taxi tour. Cruise ships dock at Makassar’s Soekarna Hatta Harbor. You will “nd the cruise dock o!ers a cruise terminal with limited facilities. There is wi-” and some representatives of the city and perhaps some souvenir vendors, but that is about it. The city centre of Makassar is within walking distance. Your ship will be right in the middle of town. There are some some sights to the north, east and south. That means that walking might not be the best idea with these distances and humidity. Most people opt for a taxi to go on a tour out of town and people staying in town can opt for a rickshaw. You will find freelance taxis at the exit of the port. Freelance taxis are not the official ones, but vehicles owned by individuals who are at the cruise terminal to sell taxi tours. Expect to pay about 50 dollars for half a day of sightseeing depending on your negotiation skills. 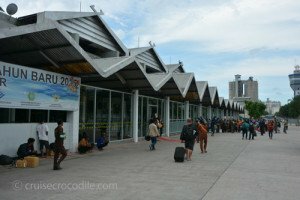 In whole of Indonesia the Blue Bird taxi company is the o#cial one, but not in Makassar. They do have metered taxis but they either have a dark blue or yellow colour. The price ranges a bit. The bicycle taxi or trishaw is also a great way to get around Makassar. These vehicles can take you all over town and they are rather cheap. Negotiate before stepping in and know that a reasonable price is about 10 US dollar per hour of sightseeing. If you are very ambitious you can “t 2 people in 1 trishaw. The road is full of trishaws like this. They are the bicycle taxis you will find in town. It is a great way to explore the town. Hire one for a couple of hours and see the hole town of Makassar. A local domestic brand of beer is Anker. Why not try it when going for a refreshment. It probably is not the best beer you have ever tasted, but definitely worth a try. On Jalan Terong you will find a colourful local market on the open street. Find any ingredient and product from Indonesia here. This is authentic Indonesia were you find the backbone of the economy. Pick up your local spices to bring back home right here. There are several islands in front of the harbour of Makassar. They seem like a little bit of paradise and they are. This is the Kayangang island. You will find lots of simple restaurants and rooms for rent here. In front of Fort Rotterdam is where you catch the boat to it. This is another island just a few hundred meters off the coast of Makassar. White sandy beaches and restaurants, do we need to say more. Rent a small bamboo shelter on the beach for a small fee and enjoy your day. Bring your snorkelling gear because there are lots of diving spots here. 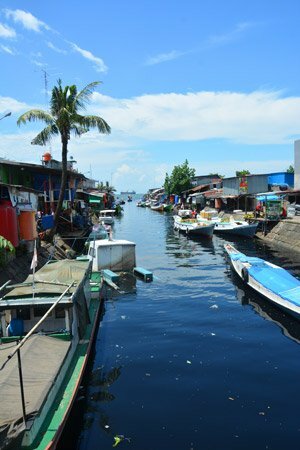 Across Fort Rotterdam you will find boats to take you there. 3 kms north of the port is where you find the old harbour of Paotere. Pay a small entrance fee to be able to get acquainted with the local fisherman. This is a great opportunity to the local fishermen at work. At the old harbour (Paotere) is where you can find true local life. Indonesia as you pictured it is what you will find right here. Take a couple of hours to explore it. In the harbour of Paotere is where you find the famous Pinishi Schooners. These wooden sailing ships are iconic for Indonesia. Today a small fleet is still operating, mainly between Jakarta and Makassar. Product they often carry vary from timber to cement. If you want to have a look on board tip about 50.000 IDR and ask you can come on board. The Makassar cruise dock is located in the container port of Makassar. It is closely located to most highlights in town. 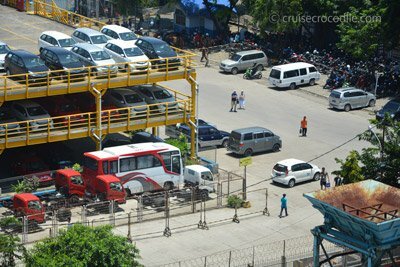 Read all about the docking location and facilities in the full Makassar cruise port guide. This is the one of the best preserved examples of Dutch architecture in Indonesia and it doesn’t get more tangible than this. Fort Rotterdam is a landmark in Makassar with historical traces dating back to the 16th century. It stand witness to many episodes of Makassar’s history. Inside are several museums and it is simply a must to visit this sight while you are here. This is the biggest mosque of Sulawesi and it is standing proud in the city centre of Makassar.